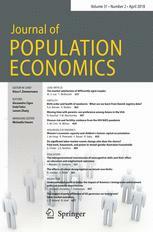 "Inter-generational cultural assimilation is hindered by immigration restrictions" "Inter-generational cultural assimilation is hindered by immigration restrictions"
This is the conclusion of a new scientific study forthcoming in the Journal of Population Economics, the leading academic outlet in population economics. The Journal is supported by the Global Labor Organization (GLO). Message: Inter-generational cultural assimilation is hindered by immigration restrictions. As migration research has shown, restricting free labor mobility leads to more migrants in the host country. People stay longer or forever and bring family. The 2014 article on Circular Migration by Klaus F. Zimmermann has reviewed this point providing evidence for Mexico and Germany. In the German context, the 1973 migration labor recruitment stop has lead to more migrants when the restrictions were binding. In this tradition, a new scientific study forthcoming in the Journal of Population Economics investigates the impact of restrictions on cultural assimilation. If those migrants with a stronger affection to the culture of origin are more temporary, more of them stay even permanently, and restrictions may lead to a slower cultural assimilation into the host country, among them or even in the next generation. The new paper studies the impact on second-generation cultural assimilation in this context. We study the effects of immigration restrictions on the cultural assimilation of second-generation migrants. In our theoretical model, when mobility is free, individuals with a stronger taste for their native culture migrate temporarily. When immigration is restricted, however, these individuals are incentivized to relocate permanently. Permanent emigrants procreate in the destination country and convey their cultural traits to the second generation, who will therefore find assimilation harder. We test this prediction by using the 1973 immigration ban in Germany (Anwerbestopp) as a quasi-experiment. Since the ban only concerned immigrants from countries outside the European Economic Community, they act as a treatment group. According to our estimates, the Anwerbestopp has reduced the cultural assimilation of the second generation. This result demonstrated robustness to several checks. We conclude that restrictive immigration policies may have the unintended consequence of delaying the intergenerational process of cultural assimilation. The responsible editor has been Klaus F. Zimmermann.